To eliminate V segregation, which significantly deteriorates the homogeneity of continuous casting steel billets, V segregation in the C-Mn steel billet was observed by microscope, SEM and EDS. The formation mechanism and control measures for V segregation were proposed. Results show that many slim V segregation strips are distributed on an inverted conical surface and that most segregation strips start from the vertex of the inverted conical surface. A series of inverted conical surfaces containing V segregation strips periodically appears along the longitudinal direction of the billet. The microstructures in the V segregation strip are fine granular structures, while the microstructures outside the V segregation strip are coarse Widmanstätten. The V segregation strip also contains many inclusions and porosities. The formation mechanism for V segregation, which is illuminated by a physical simulation of Al-5wt pctCu alloy, is attributed to the fissure in the equiaxed dendritic network torn by solidification contraction. By controlling the percentage and distribution of equiaxed grains, the V segregation in the billet of C-Mn steel is completely eliminated. Manuscript submitted August 29, 2018. X.P. Ma, D.Z. 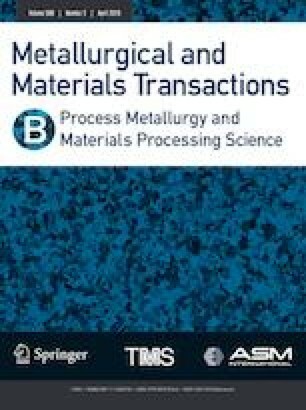 Li: International Journal of Cast Metals Research. https://doi.org/10.1080/13640461.2018.1558965.